198 pages | 1 B/W Illus. Responding to climate change has become an industry. Governments, corporations, activist groups and others now devote billions of dollars to mitigation and adaptation, and their efforts represent one of the most significant policy measures ever dedicated to a global challenge. Despite its laudatory intent, the response industry, or ‘Climate Inc.’, is failing. Reimagining Climate Change questions established categories, routines, and practices that presently constitute accepted solutions to tackling climate change and offers alternative routes forward. It does so by unleashing the political imagination. The chapters grasp the larger arc of collective experience, interpret its meaning for the choices we face, and creatively visualize alternative trajectories that can help us cognitively and emotionally enter into alternative climate futures. They probe the meaning and effectiveness of climate protection ‘from below’—forms of community and practice that are emerging in various locales around the world and that hold promise for greater collective resonance. They also question climate protection "from above" in the form of industrial and modernist orientations and examine large-scale agribusinesses, as well as criticize the concept of resilience as it is presently being promoted as a response to climate change. This book will be of great interest to students and scholars of climate change, global environmental politics, and environmental studies in general, as well as climate change activists. The introductory chapter by Wapner (global environmental politics, American Univ. ), who is also one of the publication’s editors, illustrates that he is a wickedly skilled writer. He wastes no time sticking it to what he calls “Climate Inc.,” i.e., the “well-meaning people, organizations, and governments” who currently address global climate change. He rhetorically questions what humans have to demonstrate for environmental change efforts over the last few decades. Wapner answers that when the Kyoto Protocol was negotiated in 1997, humans discharged around 24 billion tons of CO2 into the atmosphere. Now, this has amplified to 36 billion tons, which he links to an 0.8 degree Celsius increase in temperature since the 18th century. The book’s thesis is that existing environmental approaches are hopelessly inadequate. 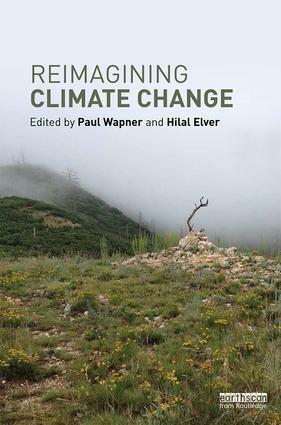 Climate change requires a complete “envisaging and reformulating [of] first principles.” The problem this reviewer finds is that with the exception of a chapter on climate change in the Arabian Peninsula, the volume’s nine authors sail off into the leftist intellectual stratosphere, dismissing geoengineering, dissolving national borders, and reordering all societal operations along lines of climate justice. How to accomplish goals is hardly hinted at. However, the chapters do offer well-informed references to radical climate policy movements. Paul Wapner is Professor of Global Environmental Politics in the School of International Service at American University, USA. Hilal Elver is the UN Special Rapporteur on the Right to Food, and Global Distinguished Fellow at the UCLA School of Law Resnick Food Law and Policy Program, USA.